Eyes dipped in Krishna prema and mind suffused with rasa tattva and siddhanta gives Sri Visvanatha Cakravarti the power and vision to see Srimati Radharani EVERYWHERE, even in the first verse of the Srimad Bhagavatam Canto One Verse One. “O Bhagavan Sri Krishna, son of Vasudeva, O all-pervading Personal God, I offer my respectful obeisances unto You. I meditate upon Bhagavan Sri Krishna because Krishna is the Absolute Truth and the primeval cause of all causes of creation, sustenance, and destruction of the manifested universes. Although Sri Krishna is directly and indirectly conscious of all manifestations, Krishna is independent because there is no other cause beyond Krishna. “Aspiring for the highest goal, we meditate on Radha and Krishna from whom arises the height of madhura-rasa. Giving up all other gopī lovers (itarataḥ), Krishna followed Radha alone and became subservient (anvayāt) to Radha. “Among all the gopīs, Sri Krishna experiences the summit of sweetness in the company the principal gopi, Srimati Vrndavanesvari. Because Krishna is a dhīra-lalita hero, Radhika alone remains with Her lover (svarāṭ) as a svādhīna-kāntā, a lover who controls Her beloved Sri Krishna. “Abhijnah svarat means that Sri Krishna is a completely transcendental, independent gallant lover skilled in all nuances of rasa. The word abhijnah (omniscient) means Sri Krishna has complete knowledge and skill in everything suitable for rasa such as the sixty four arts. The word svarat means that unlike material heroes, who are affected by time and karma, Sri Krishna, the sole enjoyer of transcendental rasa, madhurya-rasa, is absolutely independent and transcendental. “The phrase tene bhrama hṛdā ya ādi-kavaye means that Sri Krishna alone transferred the truth (brahma) about ādi-rasa (madhura rasa) into the mind and heart (hṛdā) of Bharata Muni (ādi-kavaye), the original exponent of material rasa. The Sanskrit dictionary says the word brahma can mean truth, Vedas etc. “Or this phrase means that Krishna imparted this madhura rasa tattva into the heart of Suka Muni. 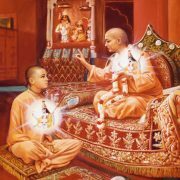 Thus whenever advanced devotees (yat surayah) read the Srimad Bhagavatam, which is packed with rasa, they faint (muhyanti) in ecstasy from tasting it and undergo transformations (sattvik vikaras), just as fire, water and earth reverse their properties (tejo vāri-mṛdaṁ yathā vinimayo). “For instance the moon gave up its quality of moving and became stunned like earth upon seeing the rāsa-līlā of Radha and Krishna at Candra Sarovara in Govardhana. Water turns solid like earth upon hearing Krishna’s flute and solid stones melt into water. The phrase tri-sargo ‘mṛśā dhāmnā svena sadā means the creation of Krishna’s three classes of lovers: the Vraja gopis, Dvaraka queens and the Vaikuntha Laksmis. Radha-Krishna ki jai! Sri Visvanatha Cakravarti ki jai! Jai Jai Sri Radhe! Srila Prabhupada: MERCY or FREE WILL?